I love Legos. I LOVE LOVE LOVE them! They encourage open-ended play, they don't make noise and they allow kids to be creative. They're also small and easy to take with us. But, WHERE did all these Legos come from? Yes, we brought some with us. Then the kids received several sets for Christmas and their birthdays this year. When possible, they'll spend their own money on them. All of a sudden, we were overrun with them. I packed 3 bins of Legos into the car for the trip from Guatemala to Costa Rica. 3 Bins! And these weren't small bins either. Then I realized that the kids were only playing with a small portion of their Legos. While most of the Legos remained in the bin, they played with the people, other character pieces (Chima and Star Wars figures) and the small miscellaneous household set-ups (BBQ, car, swords). Why are we carting around 3 bins (3 BINS!) of Legos when they're not even playing with them? It's the classic "The kids have too much of something so therefore they're not getting the value of the whole collection." This is good. Problem identified. And this means we can get rid of some stuff. Even better. Less to carry in the car. But, exactly which pieces do we keep and which go? Do we randomly do this? Is it simply "less is more"? Yes, it really is. However, all I could think about was the money spent on all those sets. Hundreds of dollars over the course of several gift giving seasons. Were we really just going to divide and devalue the sets? What would it take to put the sets back together? Is it possible? We're in Costa Rica...in a mountain home...isolated for much of the day...for 3 months...We can do this. And so the Lego Project began. It was hell. It was dirty. My back hurt. My eyes blurred. When we arrived in Costa Rica, we had a full medium-sized blue Lego container (right middle), a full small-sized yellow Lego container (left top) and a large clear plastic container (not shown). Madness! 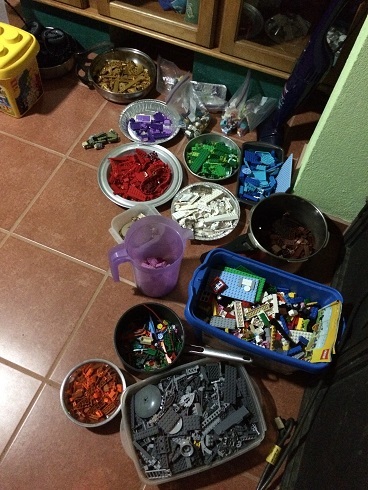 It quickly became apparent that we'd be best off sorting the Legos by color. I gathered every extra pot, tupperware container and bowl I could find in the kitchen. Most colors were also sorted by size. Tag started putting his "special" Chima characters in the bookcase behind the Legos. This drove me crazy. Every time he went into the bookcase, I waited to hear the sound of Lego containers emptying as he stepped on them. Packaged sets. This is probably 15% of the sets we put together. When my little sister came to visit, I sent her home with an extra suitcase full of Lego sets. We're down to one bin that isn't full to the rim. We have room for some bowls (that we used for sorting the Legos), a baggie of characters for each kid and one set with directions for each kid too. Everyone is happy. We've had to sort other toys as well, but nothing was as involved as the Lego Project. Elle got rid of every Barbie she brought, since she received enough Monster High Dolls to replace them! It was lovely seeing her give them to a family with 3 young girls. We've also found new homes for stuffed animals and several books. If a toy has served it's purpose, is broken or if we have too many, it's time to move-on. That's just how life is for us these days. I feel good about where we're at. In a normal scenario (stable house, kids have their own consistent space), this wouldn't be a problem. But being on the road forces us to live a minimalist lifestyle. We're happier with less.